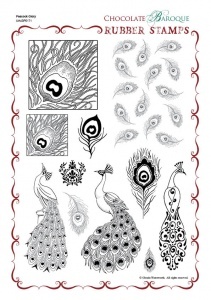 This rubber stamp set contains a selection of stylised peacocks and peacock feathers. A rich and elaborate series of designs that are suitable for a variety of occasions and projects. I ordered these stamps having seen them used is a craft magazine and I was so glad I did. not only did they arrive the very next day but the quality of them is amazing. They are very detailed but so well made that they always give a really clear print. I'm so glad I bought them. Beautiful and timeless design. Makes the most beautiful cards - love having backgrounds, feature stamps and some smaller ones. I love peacocks and was thrilled when I found this set! The quality and craftsmanship of CB's stamps is amazing. The images are clean, crisp and clear and the details are sharp without becoming muddy or fuzzy when stamped! I will definitely be back to buy more! 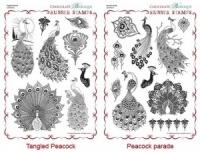 I am constantly telling people I know in the stamp community about CB and their beautiful stamps and wide variety of unusual stamp set designs!